BLOCKS is a modular watch project that had raised nearly EUR 1.5M on Kickstarter back in 2015. The final product is due to be released by this year’s end, and the first public presentation of Blocks will be at Geek’s Live on October 12th! 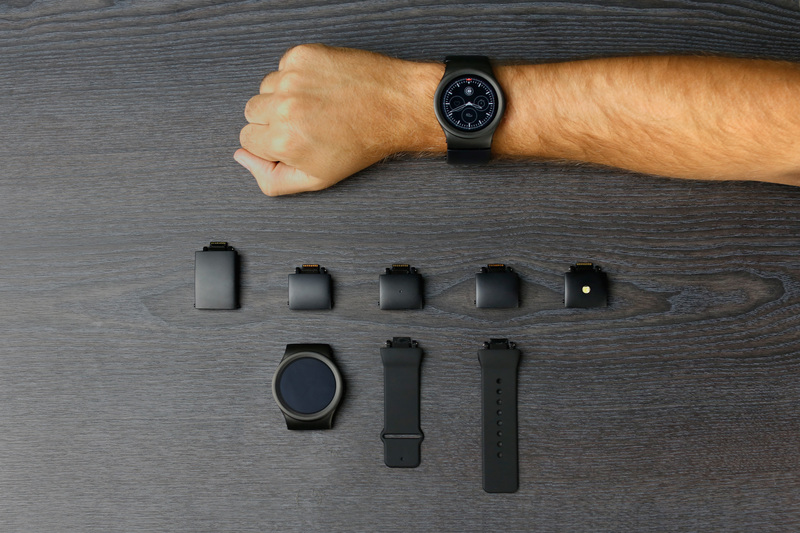 Blocks is a smartwatch that features the basic functions that could make it the equal to the competition. It displays the notifications, a tracker of physical activity, a microphone, Bluetooth support and Wi-Fi , haptic feedback, all behind a color AMOLED screen with a size of 1.39 inch and a resolution of 400 × 400 pixels. According to the manufacturer, the watch will last about 1.5 days per charge, thanks to its 300 mAh battery. Inside, we find a 2100 Snapdragon processor with 512MB RAM and 4GB of RAM. The Blocks is compatible with Android and iOS. The peculiarity of this watch comes from the external modules that can be added. By nesting one within the other (up to 4 “blocks”), you can extend its capabilities. Thus, the first modules offer a larger battery, a cardiac activity monitor, GPS, NFC, a programmable button or a block “adventure” with the measurement of altitude, atmospheric pressure and temperature. From this, the possibilities are exponential …!